Yummy, we're live! — Pure Kakaw - cacao drinks for creativity, health & ceremonies. From Ometepe Island in Nicaragua, surrounded by nature and cacao trees, somehow with internet, we are proud to share this new website. Still buzzing from a cacao celebration yesterday in a beautiful permaculture community. This is one of the places that inspired to continue our cacao journey. We are exploring farms and regions in Nicaragua and are close to selecting the quality cacao we want to bring to you. A direct and transparent road from the source is important to us. Criollo cacao pods growing around us at InanItah, Isla de Ometepe. Traveling through Central and South America we experienced cacao in its pure form. An incredibly healthy and powerful food. Cacao, or kakaw in Classical Mayan, has been a sacred plant to native people in these regions for thousands of years. We want to share how it can deepen practices like yoga and meditation, but also increases focus for work and creativity. 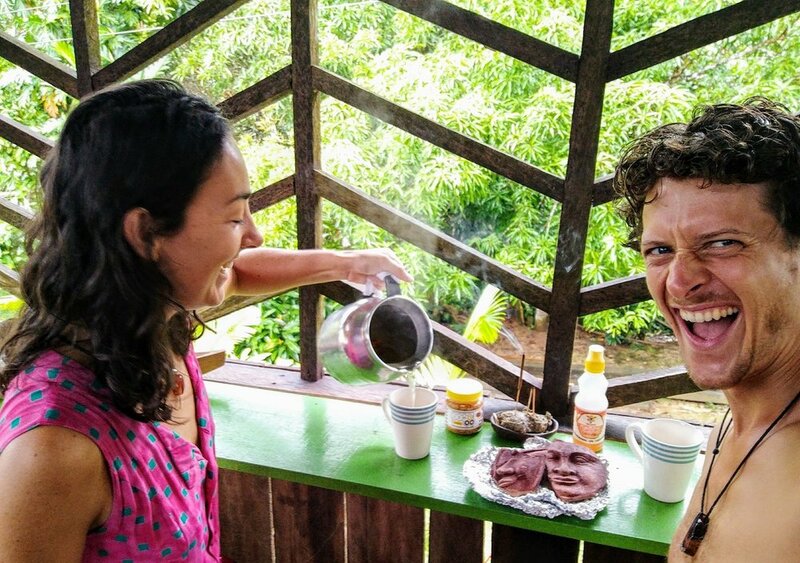 Experimenting with different cacao drink recipes in the Amazon.